Stenciled concrete is popping up everywhere and when you consider the number of advantages it carries, it’s easy to see why. Stenciled concrete opens up an almost unlimited amount of potential looks, styles and textures. You can turn your back patio into a Romanesque terrace using terracotta stenciling. You can make your driveway look like the entry point to a Californian mansion by creating a tiled look. You can make your home look like a stately, Victorian homestead or cottage by using Bluestone stenciling, or you can keep it neat and simple by creating brick-bordering. If you were to create these looks using authentic materials, you’d have to prepare yourself to fork out a fortune. Slate for example, will cost you more than three times as much as a concrete driveway and using stenciling, you can replicate the look of a slate driveway, complete with texturing and natural colour variations. The other area that stenciled concrete comes out a winner is when it comes to maintenance and durability. A tiled-driveway will have to be constantly re-grouted, weeds can grow in between tiles and before too long you’ll find yourself constantly replacing tiles. Compare that to a stenciled concrete driveway, which will only need to be resealed every couple of years and the paint will last for decades. All you need to do is hose it down, give it a brush to remove any dust or dirt and it will look as the day you poured it. 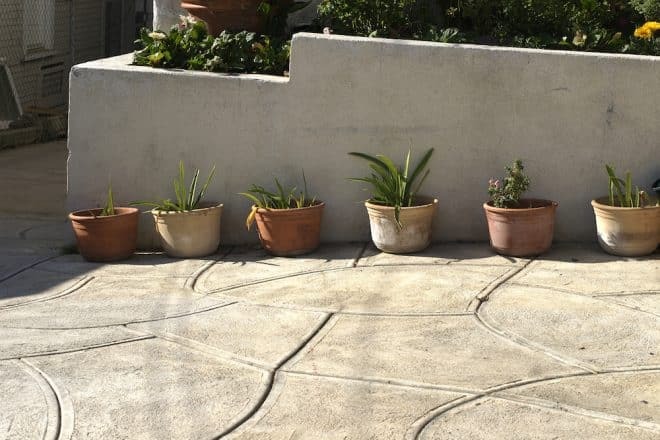 So, stenciled concrete is starting to look like a pretty clear winner when it comes to selecting the look for your driveway or concreted area, but how does it work? As soon as the concrete has been poured it should be screeded, floated and edged in the same way that you would prepare a normal slab of concrete. As soon as the concrete is free of any excessive bleed water (but still a little moist), two people should begin rolling out the stencil. One person should uncoil the stencil-roll while the other person should hold the uncoiled end. Once the stencil is in the appropriate position, use a stencil-roller to paste the stencil onto the wet concrete. Once it has been pasted, you need to trim approximately 5mm from just inside the foam boards in order to allow for swelling. Colour hardener needs to be spread, by hand, across the concrete. The manufacturer instructions will tell you how much hardener you need to spread. Once it has been spread, use a bullfloat to mix it into the slab. It’s important that the slab is still wet enough to absorb the hardener, so don’t wait too long in between laying the stencil and adding the hardener. If you are trying to achieve a stone or brick look the texturing is very important—a texture brush will give the slab a realistic profile. If you are going for a tiled look, you don’t need to worry about texturing, instead, smooth out any imperfections using a towel. To achieve texturing and natural color variation, apply an antiquing agent. The agent needs to be applied while the slab is still supple enough to be textured but firm enough to handle the weight of the roller. As the roller makes depression in the slab the natural pigment of the colour will create variations in colour, creating a completely natural look. After you’re happy with the texture, remove the stencil, beginning with the piece of the stencil that was laid last. Return the next day and use a pressure cleaner to remove the agent, cut all control joints and seal the surface. Sandblasting or etching is the most popular options for stenciling existing concrete. Both of these methods involve removing a layer of the existing concrete and leaving the stenciled areas intact, similar to the relief in artwork. To sandblast, just place the stencil on the concrete and go over the area with a sandblaster. Etching involves the use of a gelled acid, which is spread over exposed areas. You need to ensure that the stencil you use is strong enough to stand up to the abrasive sandblaster and caustic gel. Contact Everlast Services for recommendations on products and stencils and for any further information on concrete. We also provide a service that is fully customisable to your needs and the look you want to create.